The Nike Pro Rival Women's Sports Bra is made with Dri-FIT fabric to help keep you dry and comfortable during your workout. Reinforced molded cups deliver coverage and support, while a V-neckline and contrast details offer a feminine fit and athletic look. Fabric: Body: Dri-FIT 87% nylon/13% spandex. 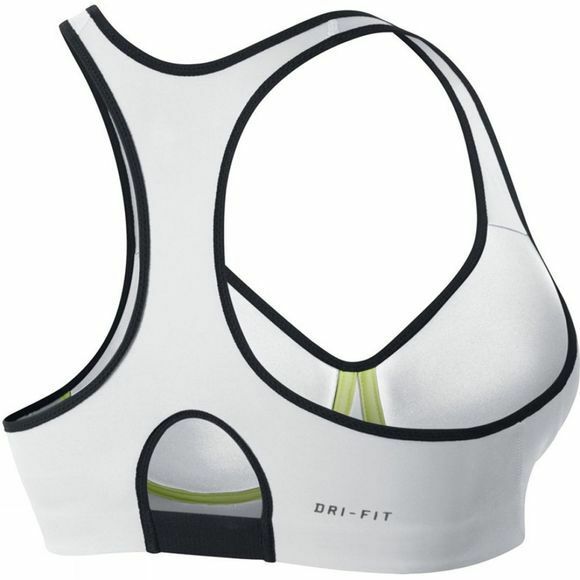 Mesh/mesh lining: Dri-FIT 81% nylon/19% spandex. Center front lining: Dri-FIT 80% polyester/20% spandex. Side panel lining/strap lining: Dri-FIT 88% recycled polyester/12% spandex. Pad top/bottom fabric: Dri-FIT 100% polyester.